Rachel appears regularly on TLC's Ready, Set Learn during Short Stuff. This triple award-winning CD contains Parent's Choice Recommended music and stories for children ages 3-10. 6. Can You Dance Like That? This recording has been honored with three national awards (Parents' Choice, Parent Council Seal and Parent's Guide Children's Media Award). This recording was also a top five finalist for two awards in 1999. It honored with as a Nashville Music Award Finalist for Best Children's Recording and a Children's Music Web finalist for Best Classic Music for Young Children (the only award truly selected by children). Rachel Sumner's music videos were featured regularly for years on The Learning Channel Monday-Friday mornings on Ready, Set, Learn during Short Stuff. This is awesome! One of the most fun-filled children's recordings I've heard! This is a great CD! My four-year-old daughter loves it and wants to hear it again and again! She goes around singing the songs, laughing and dancing! This is certainly a fun-filled tape that children will love, and that parents can enjoy right along with them! 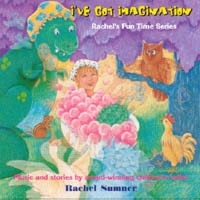 Parent's Choice Recommended music and stories for children ages 3-10.